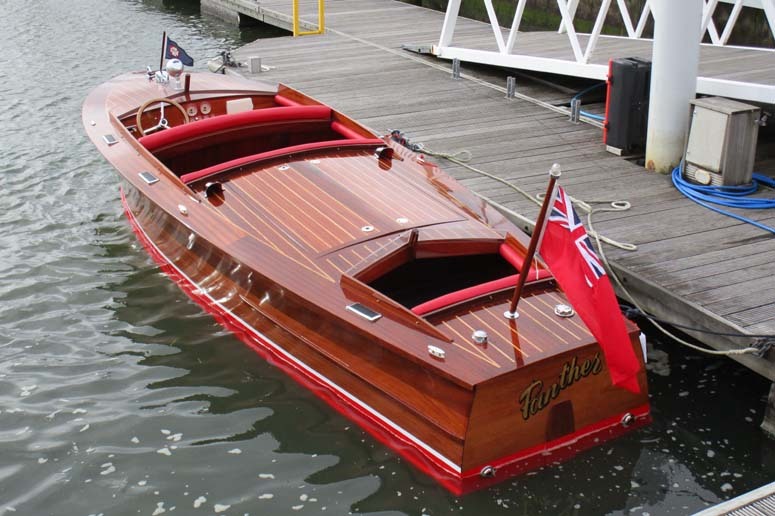 The design and construction method used identified the boat as an early 30's example of a Gentleman's Runabout and these details also pointed it towards being a British Power Boat company design. 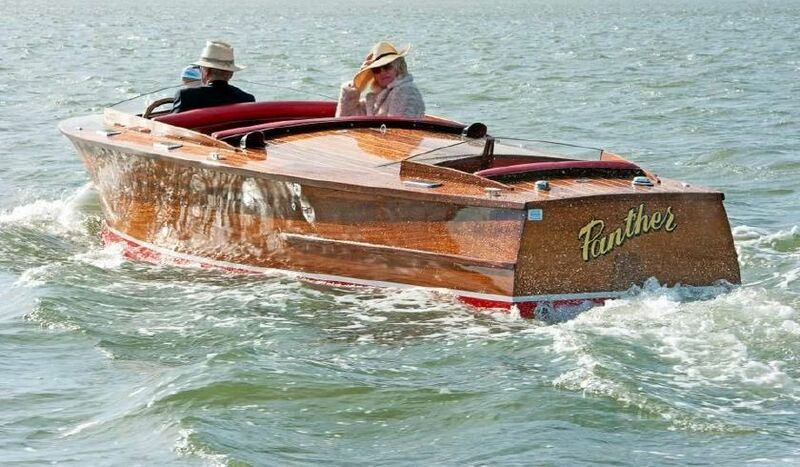 The boat is very similar to a Riva, Hacker, Garwood or an early Chris Craft. 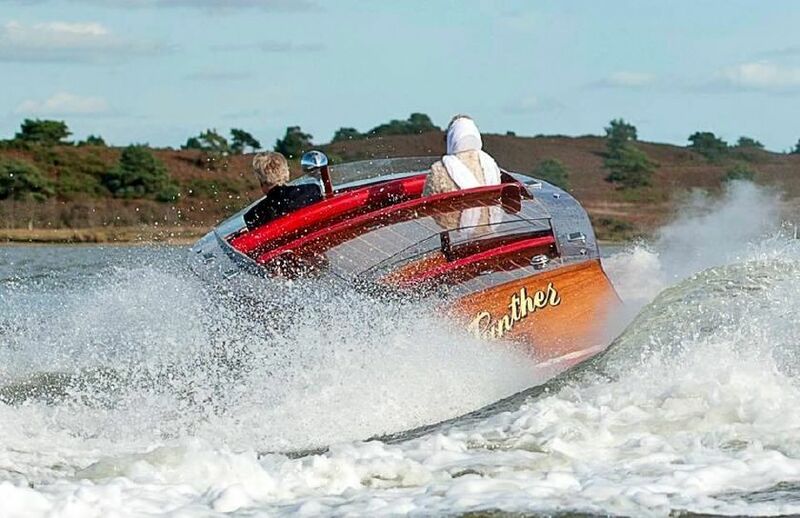 The boat was taken to CServe, a well known, Poole based, boat builders who are experienced in both wood and modern technology construction methods. Caerbont were subsequently approached to design and manufacture it's set of marine instruments. 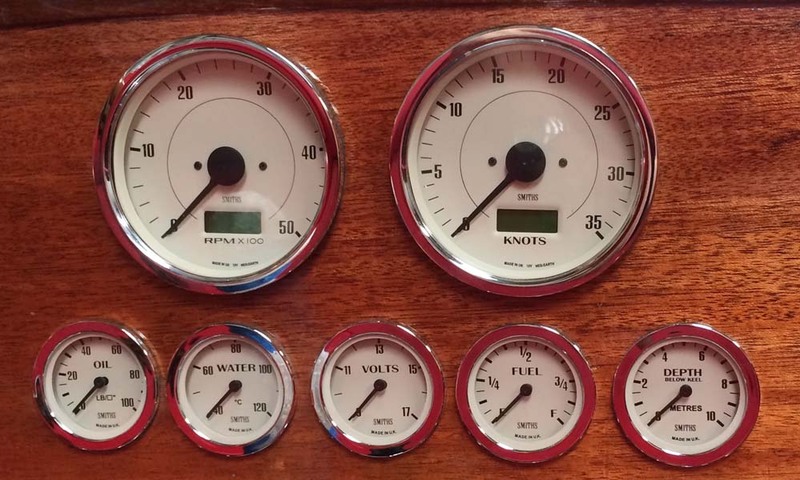 The panel (left) is populated with custom gauges as specified by Mike Pascall. 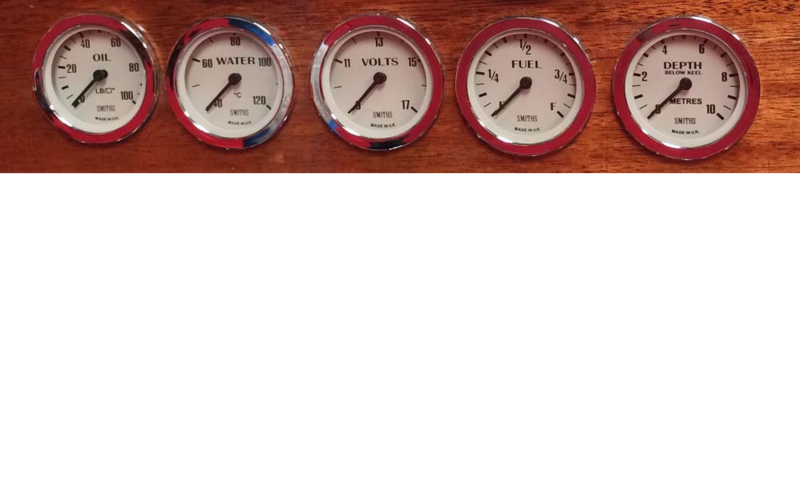 We worked closely with the customer to ensure the gauges reflected the style of the boat . The set incorporates an Hours Counter, Speedometer, Oil Pressure Gauge, Fuel Gauge, Coolant Temperature Gauge, Voltmeter and depth gauge that works from an input from his depth sounder. He also has a GPS speedometer and hours counter. All of the instruments feature LED lighting and the classic 'Smiths' styling with flat chrome bezels magnolia dials. The Clockwise Speedometer which is 100mm in diameter measures speeds up to 35Knots, features a remote reset switch and is LED illuminated. The Matching Tachometer or Hours Counter is also set within a 100m Case and measures revolutions up to 5000RPM and is also LED lit. A set of 52mm measuring gauges completes the vessel's instruments. Shown in the image reading left to right are oil pressure gauge measuring readings from 0-100PSI, A coolant or water temperature gauge measuring temperature ranges from 40 to 120 degrees celsius,a 9-17Volt stepper voltmeter, fuel gauge and depth gauge measuring up to 10metres. The boat has a traditional look complete with a modern GPS with depth sounder, and a sophisticated shore power charging system with 240V mains circuit and dual engine and domestic battery installation. All instruments fitted in the vessel feature LED illumination and feature our waterproof seals to IP67.